Designing your child’s nursery is one of the most exciting tasks to complete before your baby boy arrives! Some claim that designing a baby boy’s nursery isn’t as exciting as a girl’s nursery, but they’re wrong! This guide will tell you the top nursery essentials you must get for your little baby boy. First, you have to decide whether you want a crib or a bassinet. Some parents, such as I, used both. I used a crib for the nursery and a bassinet for the weeks when my children sleep in my room after birth. A bassinet is only usable for the first six months or even less. Some are smaller, and your baby will outgrow it before long. 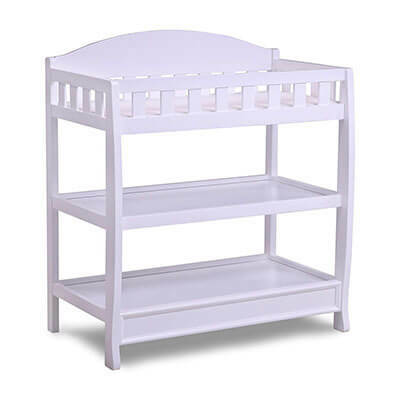 Bassinets can be wheeled around easily and placed beside your bed. The American Academy of Pediatrics recommends that parents room share for the first six months to a year old. A crib, on the other hand, is a long-term purchase. 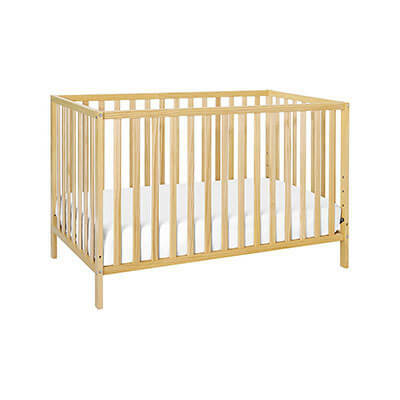 Cribs can be used from birth up to three years old, or whenever your child outgrows the crib. You can use them for years, and cribs hold up well over the years. Most parents only need to purchase one crib for all of their children. Convertible cribs can transition into a toddler bed and, some, a full-sized bed. Shopping for a crib is a big deal because it’s one of the largest purchases you’ll make. It’s best to buy new because safety standards change often. A used crib has the possibility that something isn’t right with it, especially antique cribs. They’re adorable, but drop-side cribs should never be used. For baby boys, I love the Babyletto Hudson 3-in-1 Crib. The mid-century modern design is perfect for any theme, and it has the GreenGuard Gold Certification, which means it’s been tested for over 10,000 chemicals. It is pricy though! A cheaper, affordable choice is the Union 2-in-1 Convertible Crib. It’s basic, without any frills or fancy features. It only transitions to a toddler bed, but it’s the right price! If you decide to purchase a crib, you will also need to purchase a mattress for your child to sleep on each night. A crib mattress is an important purchase. You shouldn’t just pick the first, cheapest crib mattress that you find. A bad mattress is unsafe and could potentially lead to death. A good crib mattress is firm. For infants, the firmer the better. A firm mattress has a huge effect on reducing SIDS. You also have to make sure the crib properly fits the crib that you select. Any gaps could cause your baby to suffocate or get stuck. Some parents worry about the chemicals and gases used in the many crib mattresses on the market. If you have those worries, consider purchasing an organic crib mattress! 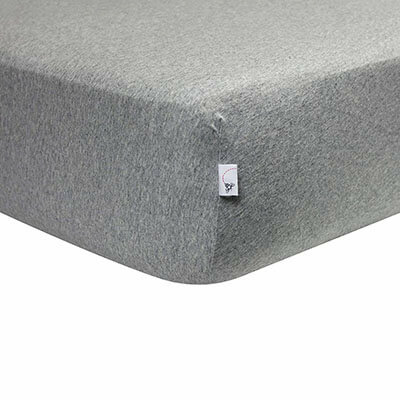 Many organic crib mattresses are certified without any harmful chemicals. 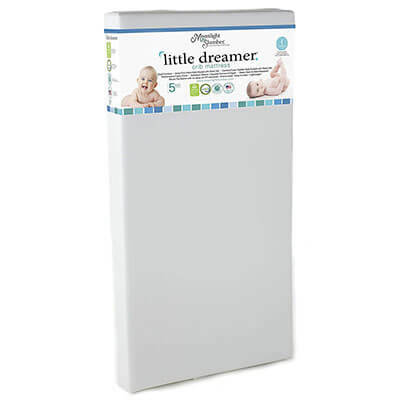 The Moonlight Slumber Little Dreamer Dual Crib Mattress is a great choice. It’s a two-stage mattress featuring a firm side for infants and a softer side for toddlers. Moonlight Slumber uses waterproof, durable fabric with extra-tight seams. 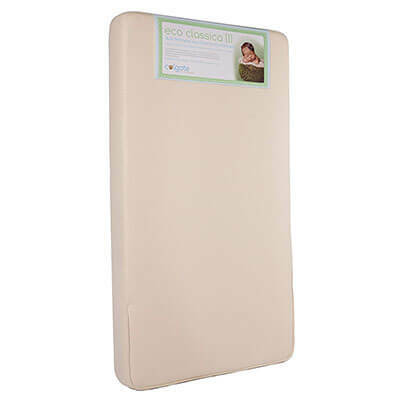 We know some parents want an organic crib mattress, and our pick for the best one is the Colgate Eco Classica. 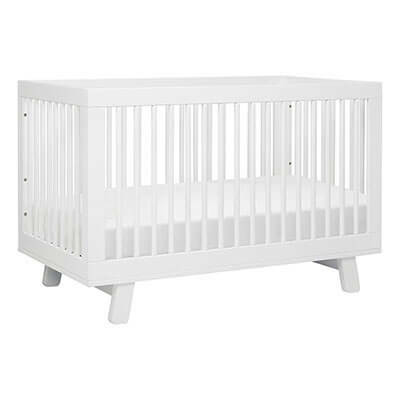 It’s a hypoallergenic, phthalate free crib that has the GreenGuard certification! If you’re using a bassinet, you will need bassinet sheets. Either way, you want a few sets of sheets to keep on hand. Babies spit up or leak out of their diaper, and you’ll need to change them. I don’t like feeling rushed to finish any load of laundry, and these diaper explosions might happen in the middle of the night. Aside from the crib sheet and mattress pad, a baby’s crib needs to be empty at all times. Babies can suffocate in crib bumpers and blankets. Empty is best! I love the Burt’s Bees Baby Fitted Crib Sheets. These sheets are 100% organic, GOTS certified cotton, which is safe and soft for your baby. Trust me when I tell you, babies make messes all the time. Unless the crib mattress you purchased is 100% water resistant, a waterproof mattress is a necessity. Without a mattress pad to place over the top of your mattress, pee and other bodily fluids will soak right into it. Who wants a mattress that smells of pee? Not your baby! Babies spit up, puke, and have diaper explosions on a normal basis. Cleaning up messes becomes a norm for parents! Even if your mattress is waterproof, I still highly recommend that you purchase a waterproof pad. They don’t cost too much, but it’s an extra layer of protection that keeps your crib mattress nice and new. 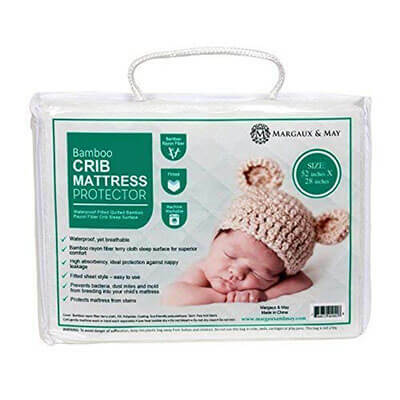 I recommend the Waterproof Crib Mattress Protector Pad by Margaux & May. Unlike other choices, it doesn’t make crinkle sounds when your baby moves, and it’s incredibly soft. Babies accumulate a lot of clothes. They go through more outfit changes in a day than adults do in three days. Luckily, their clothes items are smaller. You’ll want a few drawers so that you can store clothing, bibs, burp cloths, and blankets. If you decide you want to use a changing pad on top of your dresser, you have to make sure it’s wide enough to hold one. I’ve used the wide and tall dresser for my kids. There is no right or wrong choice. My current dresser for my youngest is fabric storage bins in an upright dresser-style that works great for small spaces! If you do go the dresser route, make sure you get a solid, sturdy one. Also, make sure you mount it to the wall. Kids can die from dressers toppling over on top of them. 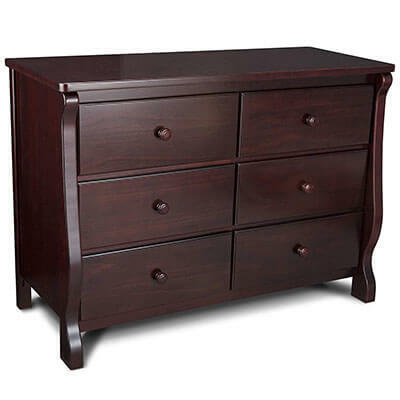 The Delta Children Universal 6 Drawer Dresser is highly rated but pricey. However, it’s a piece of furniture that’s timeless and could last through your child’s entire childhood. It’s worth the cost. Half of the time, I change my babies on the couch or the floor, depending on where we are at that time. The other part of the time, I use a changing pad. You don’t have to purchase a changing table, but they do provide vital storage for all of your baby’s supplies. We use cloth diapers, and a changing table is awesome for storage. You can place storage bins underneath for diaper supplies, creams, and all of those other odds and ends. The Delta Children Infant Changing Table is an affordable choice. It has two shelves on the bottom where you could put nice baskets to hold diapers and wipes. Anything by Delta Children is trustworthy. If you don’t want to purchase a changing table, you can place a changing pad on top of a dresser. This option works great if you want to save space and only have a crib and a dresser. 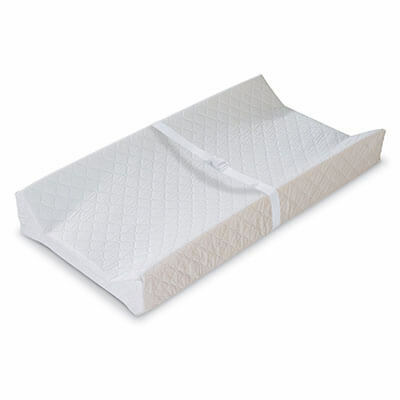 Parents love the Summer Infant Contoured Changing Pad. It has a security strap and it’s contoured for comfort. Plus, contouring means your baby can’t easily roll off of the pad. 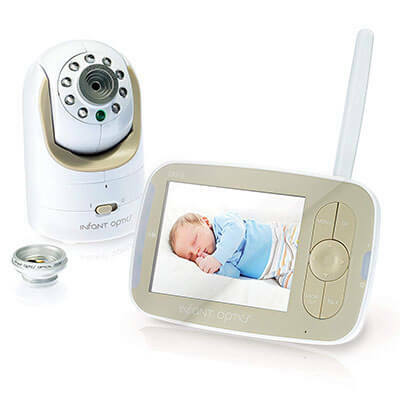 If your baby is sleeping in a separate space than you, a baby monitor is a great tool to have. My husband is a sound sleeper and he wouldn’t hear a baby crying without a monitor above his head. I like monitors that let you have multiple cameras so you can set one up in the nursery (for each of your children) along with the playroom. You take the receiver with you wherever you go, and you can always keep an eye on your children. If you want a monitor that can connect with multiple cameras, you need one that has expandability properties. The Infant Optics DXR-8 Pan is one of the best choices. It’s a video and audio monitor with 12-hour battery life and the ability to expand to up to 4 cameras. Parents love it! If you’re a working parent, a monitor doubles as a nanny cam as well. They’re fantastic investments. If you want a monitor that you can watch when you aren’t home, you need something with wireless capabilities. Your baby will be waking up in the middle of the night for weeks and months throughout the first year of life. That’s to be expected. The worst thing is when you kick the side of the crib or dresser as you stumble through the nursery to get your baby. A nightlight is a cheap item that is baby boy nursery essential. You get can simple ones that plug into the wall or fancy nightlights that display stars and moons on the ceiling. All you really need is some sort of light that makes it easier for you to find your way to the crib. I highly recommend that you take a look at the Hatch Baby Rest Night Light. It’s more expensive than you might expect, but it’s a night light, a sound machine, and has a time-to-rise feature. You can control it from your phone. As we mentioned before, babies use a lot of clothing. A hamper should be kept in your nursery so that you can keep all of your baby’s dirty clothes together. Most parents wash their baby’s clothes separately using a baby laundry detergent or some kind of hypoallergenic detergent. Plus, baby clothes are so small, and they’ll easily get lost in adult clothes. Baby socks disappear faster than storage container lids. It’s like they’re sucked into some type of clothes black hole. I love the BirdRock Home Single Laundry Hamper. It has a lid and a removable liner that easily lets you transport clothes from the hamper to your washing machine. The lid helps to keep in any stinks, which happens when your baby has a poop explosion. Middle of the night feedings are tiring, and having a comfortable place to sit with your baby is essential. You don’t necessarily have to keep the rocking chair in your baby’s nursery. These aren’t 100% necessary at all, but they sure do make life a bit easier. I’m all about things that make my life a bit easier. My son’s nursery was tiny, and I had limited space. So, I purchased a rocking recliner for our living room and fed our baby there. If you have the space in your nursery, keeping the chair there is a good idea. I also recommend keeping a basket of snacks and water bottles for YOU nearby, especially if you’re breastfeeding. Breastfeeding makes moms hungry and thirsty because now you’re feeding another human being with your body. You have to increase fluids, so you can keep your milk supply up. The Windsor Glider and Ottoman is a best-seller and affordable. It has padded arms and storage pockets. The chair cushions are removable for cleaning. 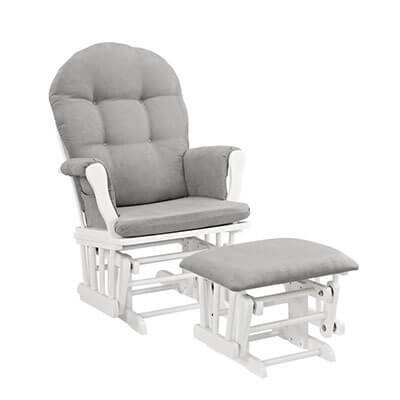 If you have a bit more money to spend on a nursery glider, the DaVinci Olive Upholstered Swivel Glider is amazing and comfortable. 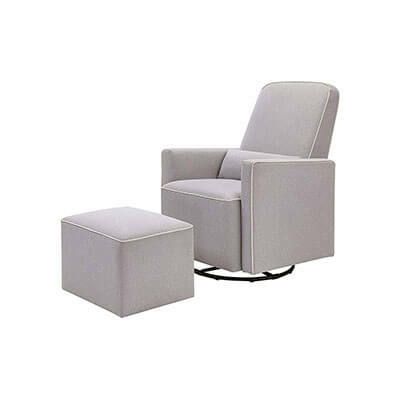 The base has a smooth, 360-degree swivel motion along with forward and backward gliding. At some point, your baby will get sick, and a humidifier is an item you’ll want to have. If your home has dry air, a nursery humidifier ensures that the air doesn’t promote the growth of bacteria and viruses. I always have a humidifier for each of my children’s rooms. There are some really cute ones that look nice in a nursery. You want to make sure they have features like automatic shut-off and can adjust to different humidity levels. Most aren’t super expensive either! 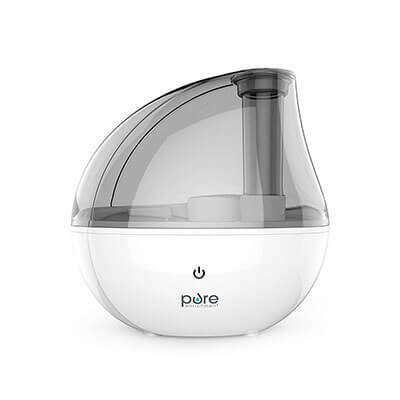 Try the Pure Enrichment MistAire Humidifier! I love the 25 hours of continuous operation and the automatic shut-off when the water level is too low. You have two choices – a diaper pail or tossing the soiled diapers into the trash. To be honest, both options stink – literally – but one stinks less and that’s a diaper pail. 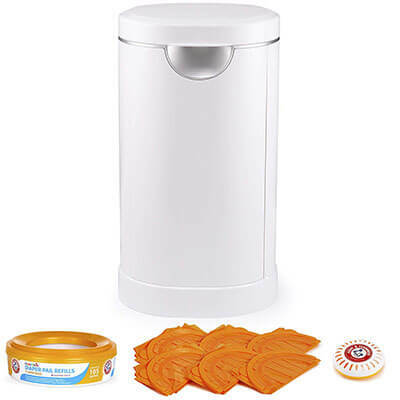 A diaper pail helps to contain the smell better than a simple trash can. Some models can be used with one hand and are a great way to deal with diapers. You put the diaper through a storage ring that keeps the diaper and smell contained inside. The diaper falls into a plastic bag. Then, when the bag is full of dirty diapers, you take it out sealed and put it in with the rest of your trash for garbage pickup. Some people will tell you that diaper pails aren’t a true necessity, and they’re right. However, I think they’re well worth the money, and they’re really not expensive anyway! Give the Munchkin Diaper Pail a try. It uses Arm & Hammer to keep the stink down. Parents love this brand, and the refills don’t cost too much either! You’re going to want some form of storage aside from the dresser. I personally love wooden storage cubicles with fabric bins. You might want some bookshelves! Babies accumulate a lot of items. You’ll have toys, washcloths, towels, those crib sheets, and books. Books seem to come out of your ears even when your baby is really little! I love cubicle shelves the best. 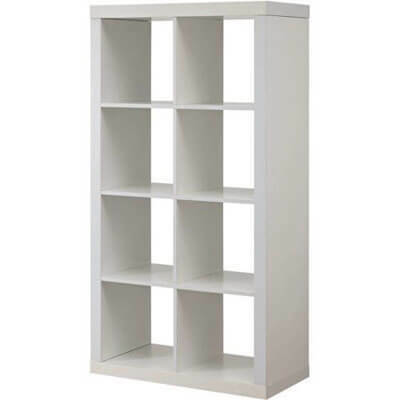 On some shelves, I put storage bins, and on the other shelves, I leave them open for books or items I want to display. Then, you can pick different fabric bins to put in the shelves. 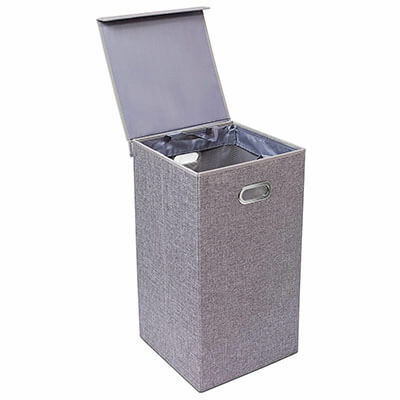 Fabric bins come in all different colors and designs! Another nursery essential I swear by is a white noise machine. Your baby was snug and cozy in your womb which isn’t a quiet environment. He could eat you talking, your spouse talking, your heart beating, blood rushing, and more. Noise is comforting. A white noise machine provides some background noise to keep your baby asleep. They’re essential to me, especially if you happen to have other kids or dogs. It helps to block out other sounds that might be in the background. 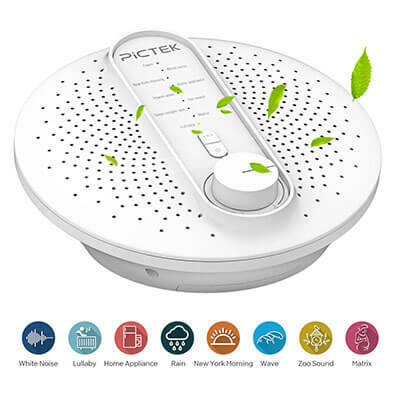 If you don’t get the Hatching Baby Night light we listed above, give the Pictek White Noise Machine a try. 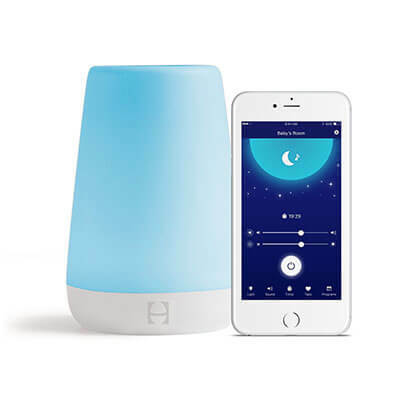 It has 24 hours of non-looping sounds to help your baby sleep a night. Designing a nursery for your baby boy is one of my favorite things! Boys have the cutest themes from trucks to farm animals. You can have a seaside design or sports teams. The sky is the limit. No matter your theme, these must-have baby nursery essentials will keep you and your baby happy. Some of these items people may not consider essential, but you want to be comfortable and save time. If the item saves you some time or keeps you more comfortable, it’s worth the money. What are your favorite baby boy nursery essentials? Share in the comments!